In our last 2 lessons, you learned how to create tapered channels using an arc ruler and today, you’ll learn how to create parallel channels using an arc ruler. This is very similar to creating parallel channels with a straight line ruler, so this should prove pretty easy for you. I will be using my PTD 12 arc ruler for this, but use whatever arc ruler you have lying around. We will be working inside the lower 4 inch wide border on the sandwich you made earlier. 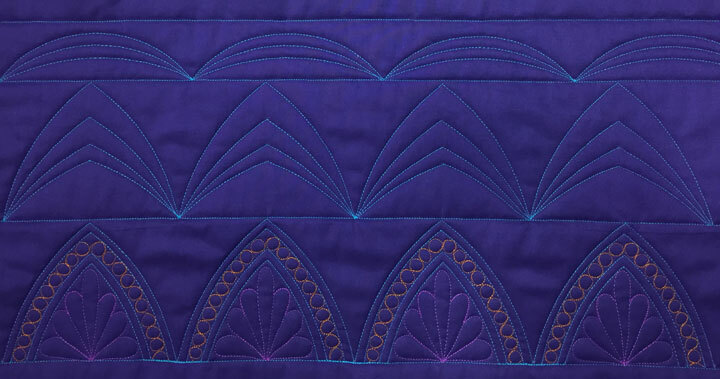 When you hyperquilt a quilted design, it adds a bit of flair, or a highlight, especially if it’s stitched in a high contrast thread. 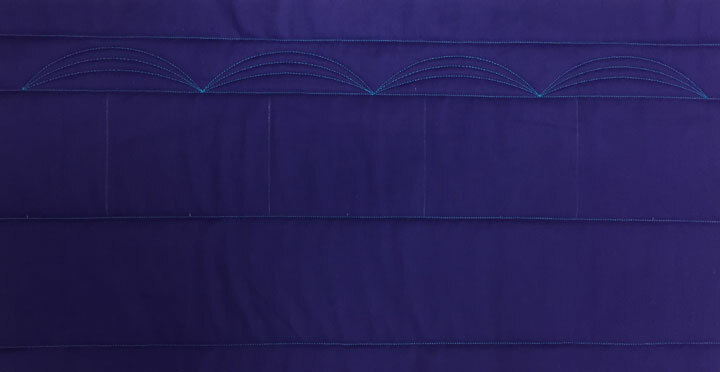 For feathers and featherettes, it always creates areas that are almost “electrified” if you use a gold or silver rayon or polyester thread. This is because you have to repeatedly bring your stitching line back to the spine (in a feather), or back to a center base (in a featherette.) Having these areas where there is increased density of thread being laid down is what causes the highlighting. 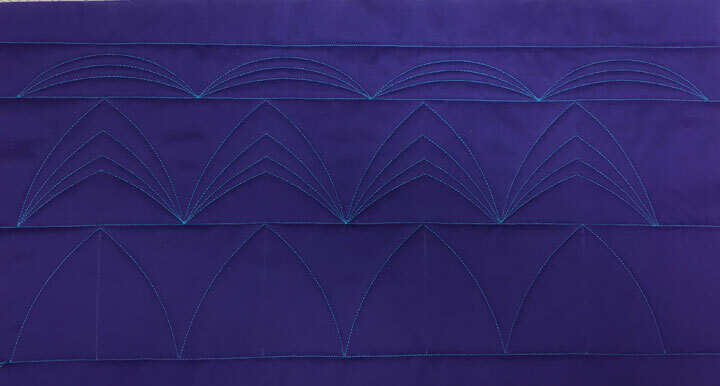 In general, if you have a border design that you like but you think it’s a bit ho-hum, think of hyperquilting a section of it because it will almost always bring that design newfound life! For me, the easiest way to build “featherette skills” is to draw a few isoscoles triangles on a piece of scrap paper. (An isosceles triangle has 2 sides that are equal.) If you look at the space created with ruler work that holds each featherette above, can you see that the space is actually is a triangle? If you go intro the challenge of drawing a freehand featherette with the goal of filling the entire space inside the triangle with plumes, it’s not so hard to do this. Begin by drawing a teardrop whose base is in the dead center of the triangle and stretch that teardrop/plume so it reaches the top of the center of that space, then carry the pencil all the way back to the center base again. Now swing up and out and to the right and draw a “hook” shape that eventually meets up w/that center plume. Carefully backtrack just a bit over the “tip” of the hook you’ve just stitched, then swing out to the right and down to that center base point again, and you’ve just added another plume. If you are working inside a triangle that is roughly the same size as the triangle inside the ruler work arched swag you should have space for 1 more plume on that first side. I would sneak out, creeping along then next to the baseline, then swing up and stitch the final hook shape. 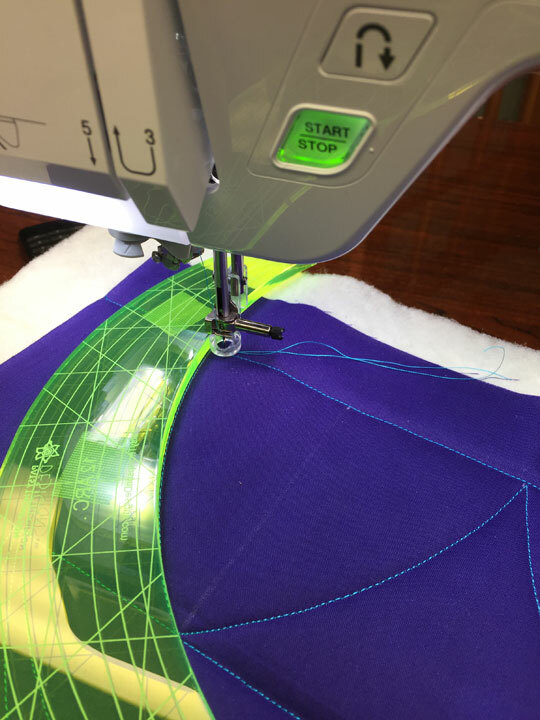 Now you can carefully backtrack down your already stitched line to arrive back at the center point. Once there, you can repeat the same process on the opposite side. *****The key to this coming out and appearing symmetric is that you are filling the exact same shape on either side of that center plume. So, if you hold yourself “accountable” to stretching/contracting your plumes so they fill the entire space, you should end up with a featherette that is symmetric! If there is a part of you wondering if this is using the bumpback feather technique, you are correct! 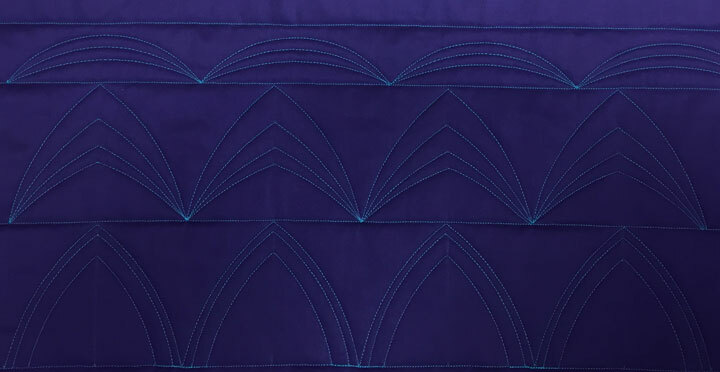 I’m not going to repeat previous posts here, but if you’re wanting to learn how to quilt various featherettes, you can find an old post by clicking here. 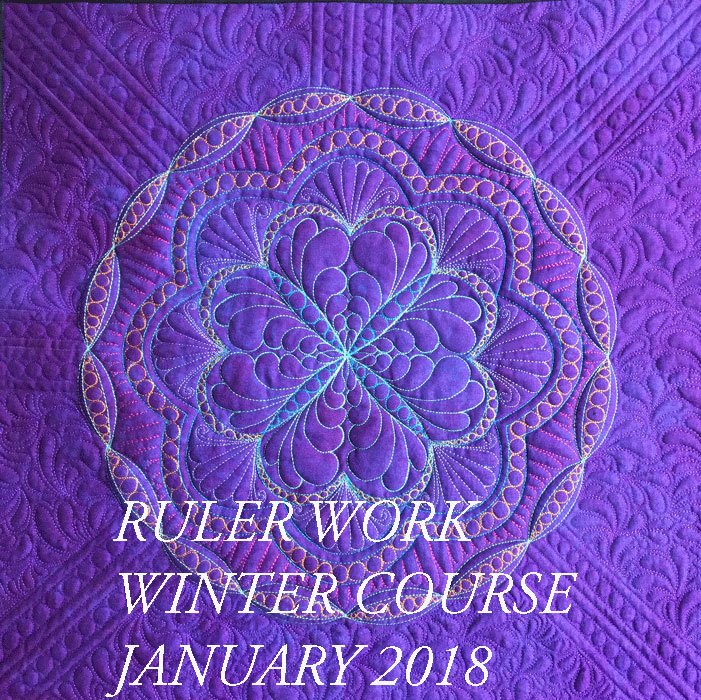 There’s a lot of info in this post and if you’re feeling overwhelmed, skip the featherette part and stitch with creating the ruler work framework. Patience, grasshopper! 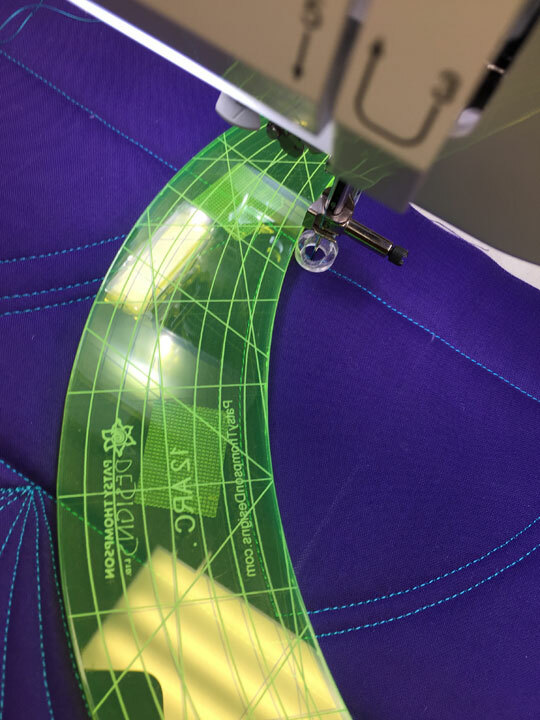 Filed under Free Motion Quilting, ruler work on a HDSM. Brilliant once again! Many thanks Patsy. Thank you so much for doing this course! I am enjoying it immensely and learning SO much. I’m no longer as intimidated by the rulers. All content Copyright © 2006 - 2019 Patsy Thompson and Ernie Bode. Patsy Thompson Designs, Ltd. is powered by WordPress. 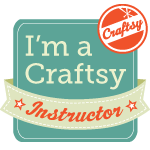 Design & Hosting by Websites For Quilters.